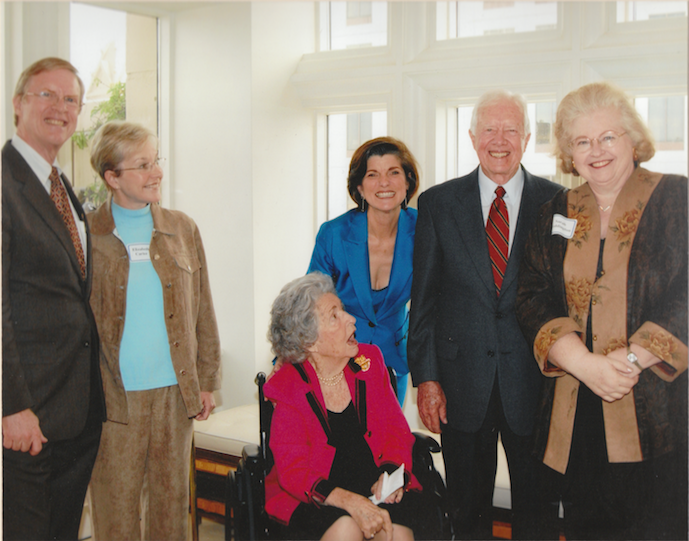 Dr. Weddington visits with President Jimmy Carter, Former First Lady, Lady Bird Johnson and her daughter Luci, and President Carter's son Jack and Jack's wife Elizabeth. Dr. Sarah Weddington, the founder of the Weddington Center, is a nationally known leader called upon by the media, organizations, and institutions of higher learning to share her experiences and knowledge. She is devoted to helping individuals develop their personal leadership skills and to increasing the number of women who hold leadership positions. Dr. Weddington is currently a speaker, writer, and teacher. Dr. Weddington is particularly well-known for her work on issues affecting women through her many roles including attorney, legislator, and presidential advisor.